A waffle maker makes life easy with delicious breakfast and easy baking. The perfect and time-saving results make it more convenient and a much-needed appliance in any kitchen. You don’t have to restrict yourself to waffles with these irons but can make use of them for preparing many other food items quick and easy. Hash browns, brownies, cookies, omelette, and the possibilities of being creative make it a versatile appliance. The tough part comes when you have to clean the iron. You can still feel deterred to bring it in daily use if cleaning it becomes tough and time-consuming. Nobody can dedicate an hour or so on cleaning the intricate patterns of a waffle maker. Bringing out the dry batter, clearing all crevices and grids become tiresome. But this should not keep you from buying this multi-tasking appliance. You can be more careful in choosing the right waffle maker that is easy to clean and maintain. This article is designed to shed some light on some quick and easy cleaning methods, and we will also be recommending some of the best easy to clean waffle makers for your convenience. 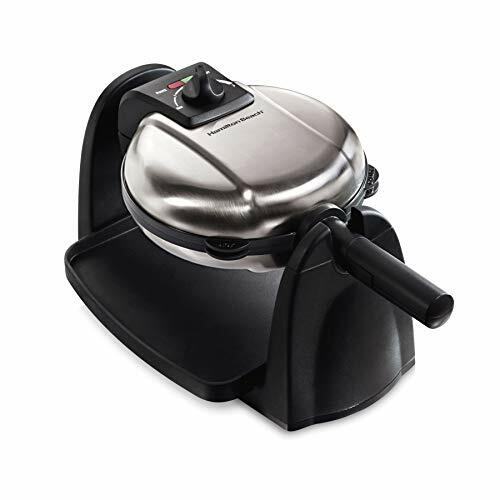 In case you want to check a complete buying guide with best waffle makers go to: Best Waffle Makers With Buying Guide . Best decision for easy cleaning is to choose a waffle maker with removable plates. Removable plates make life easy as cleaning a messy baking plate becomes a breeze. These plates are safe to be dumped in a dishwasher. Even if you don’t want to put them in a dishwasher for some reason cleaning them is easy under tap water in your sink. You can make use of a soft brush to remove the dry batter from crevices. You can save a lot of time with removable plates. The other thing that helps in cleaning is a nonstick baking plate. When we say nonstick, it doesn’t have to be a Teflon coating that many of us don’t want on our appliances. Nowadays even ceramic plates have such nonstick finish that is easy to clean. Removing batter from a nonstick surface is easier than from a rough or sticky surface. Most of these nonstick coatings are easy to clean, you only have to wipe them off with a cloth. Use a paper towel, or a cloth to remove all the leftover crumbs and oil from the baking plate. Be precise and make sure you clean all corners, around the grids and the deeper parts. For removing tough, dry batter within crevices pour some oil over it and leave it to soften up for a while. After a few minutes, remove it with a paper towel or cloth. For narrow areas around the grid, you can wrap a small piece of paper towel around a chopstick and remove the stains. Make sure to remove all excess oil from the surface of the baking tray. Following things should be considered when cleaning a waffle maker for better maintenance of your appliance. Never submerge your iron in the water, it will damage the electric elements of your waffle maker. Do not scrape the surface with any sharp thing like a knife or fork for easy cleaning. It will damage the nonstick coating of your baking plate leaving scratches. You can dip it in oil for a few minutes and then remove it easily. Always follow the cleaning method recommended in the manufacturer’s manual. If your waffle maker becomes sticky then make sure to oil the surface of baking plate before pouring batter on it. If you are looking for an easy to clean waffle maker, then we can help. Below is the list of some of the best easy to clean waffle makers. Feel free to choose the one that suits you the best. This waffle maker is designed for your convenience. It is not only easy to clean but also easy to store. Its removable baking plates can be put in a dishwasher for quick cleaning. It is a Belgian style waffle maker that bakes thick and fluffy waffles. The baking plates have a three superior nonstick coating as compare to other waffle makers that allow you to cook a variety of waffles with equal perfection. Easy to clean removable plates. Fits in small space with vertical storage. Comes with three nonstick coating. A flip-style waffle maker for an even texture. Bakes thick and fluffy waffles for thin and crispy waffles you need to choose a thin waffle maker. 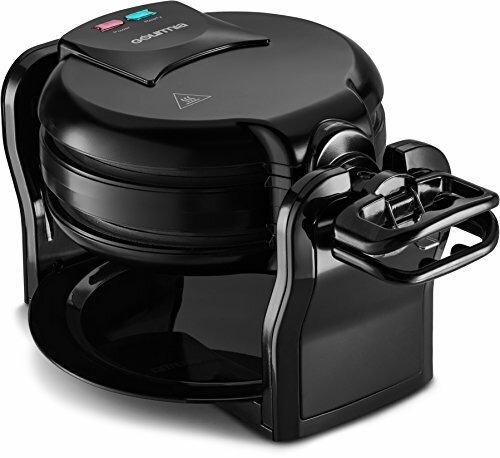 This one is another flip-style waffle maker with removable plates. The removable plates make life easy as they are easy to clean in a dishwasher. The safe nonstick coating on baking plate prevent any sticking on the surface and release waffles fast and easy. The stainless steel exterior of waffle maker is also easy to clean and maintain. Bakes thick fluffy Belgian style waffles. Flip-style iron that bakes with an even texture. Nonstick coating for easy release. Another great option for those who prefer an easy to clean waffle maker. With removable plates and drip tray, you can wash them easily in a dishwasher. 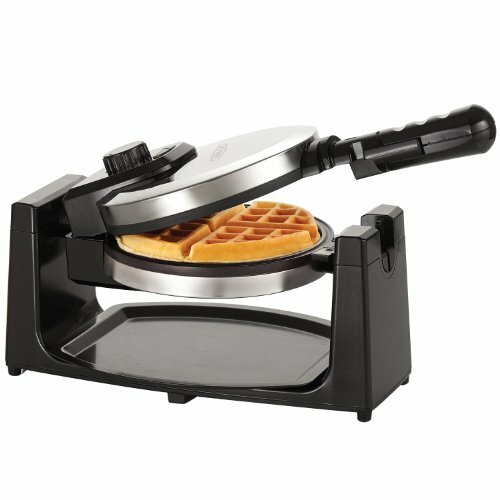 Its unique dual iron design allows you to flip out two soft and fluffy waffles at once. The iron has a durable and sleek stainless steel design. With a cool touch handle, you can open it safely without burning your hands. Removable plate and dripping tray. Double flip iron that bakes two waffles of smooth texture at a time.